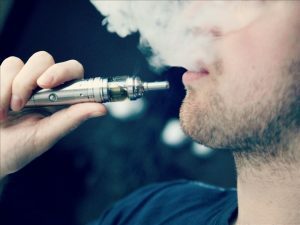 WASHINGTON, D.C. (NBC) – Despite the government shutdown, the Food and Drug Administration moved forward Friday with a public hearing about how to help teenagers get over their addiction to nicotine in e-cigarettes. The most popular e-cigarette among teenagers is the JUUL pod. Just one pod has about the same amount of highly addictive nicotine found in an entire pack of regular cigarettes. E-cigarettes are getting a whole new generation hooked, according to doctors, who say teenagers don’t understand the danger of addiction. Concerns about skyrocketing teen “juuling” as it’s called, packed with highly addictive nicotine prompted experts at the Food and Drug Administration to explore ways of helping addicted teens. One solution: get to teens through their phones. The anti-smoking nonprofit “Truth Initiative” just announced a texting program designed to help kids quit vaping. The American Lung Association takes it a step further urging the FDA to ban flavors like mango that are attractive to kids. The head of the FDA threatened an e-cigarette ban unless manufacturers can come up with a way to keep them out of teen hands.